Please note that this special hand mixed assortment includes all in stock special designs, squares, rectangles, and triangles. Due to hand mixing not every pattern is in every bag. The larger the bag size, the larger the mix of patterns. Please note that this special hand mixed assortment includes all in stock square patterns. Due to hand mixing not every pattern is in every bag. 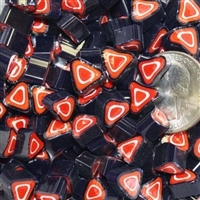 Please note that this special hand mixed assortment includes all in stock triangle patterns. Includes sizes and colors not available separately. Due to hand mixing, individual bags do not have equal quantities of each pattern. 3 oz left ~ lime/white. 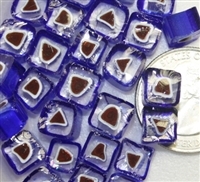 A new size for this transparent cobalt blue square pattern. Square..V26..9-10mm Square..S97..8-10mm NEW! Square..S06..8-10mm NEW! Stunning clear/dark green square. Limited quantity. NEW! Beautiful periwinkle blue/clear square pattern. Square..Z60..7-8mm NEW! Square..U64..6-7mm NEW! Square..V43..5-6mm NEW! Square..S98b..10-12mm NEW! Square..V41..4-5mm Triangle..S35..6-8mm NEW! Square..V13..8-10mm Triangle..S90..10-12mm NEW! Rectangle..175..8-10mm New Size! 2 oz left ~ Transparent peacock green/white, chunky. Also available in size 11-12mm. All of our millefiori is 104 coe. Back in stock! A triangle inside of a square! Chocolate/white/black/chocolate. Also available in size 11-12mm. Citrus orange/clear. This color really pops! VERY limited quantity received. Very limited quantity received for this pink-lavender/transparent square pattern. Thickly cut. Also available in size 12-14mm. Square..U71..6-7mm Square..U80..8-10mm Back in stock! Square..994..10-12mm NEW Size! Beautiful square bright white/clear pattern. Pink/clear. Also available in smaller sizes. 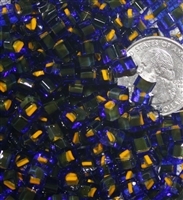 4 oz left ~ Transparent cobalt/clear, chunky. New larger size of this white/cobalt blue square pattern. Also available in size 6-7mm. Red/transparent amber/cobalt center. Thick cut. Square..S50..10-12mm NEW! Square..Z62..5-6mm Square..S06..10-12mm NEW! Special Purchase ~ Dark green-black/yellow/white/yellow. Triangle..V15..9-10mm NEW! Triangle..S26..8-10mm NEW! Triangle..S19..9-10mm NEW!